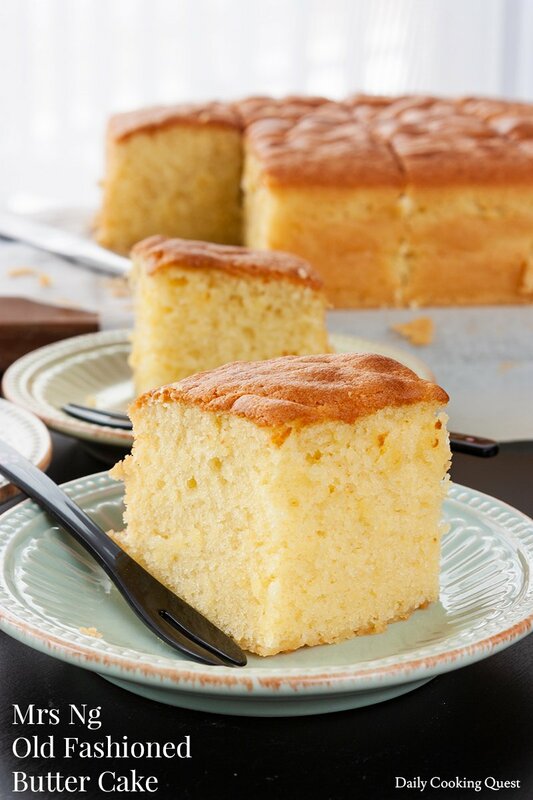 Butter cake is like a blank canvas. 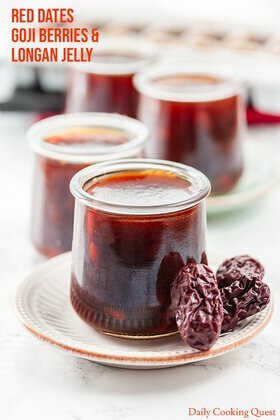 It tastes great when well made, and it can be dress up with a simple whipped cream, fresh berries, your favorite fruit preserves, and all the way to frosting if need be. This Mrs Ng version is a good one and has been shared around. I played with the original recipe a bit so I can adapt it to use only all-purpose flour instead of self-raising flour. 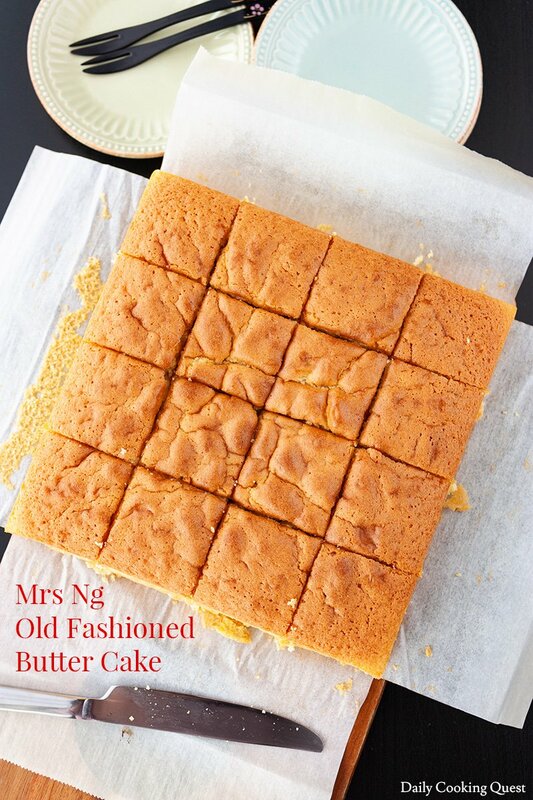 So I present to you my version of Mrs Ng old fashioned butter cake. If you bake at all, then you will notice my recipe for this butter cake calls for very basic ingredients. You need all-purpose flour, baking powder, salt, sugar, egg, butter, milk, and vanilla. Easy right? And as for tools, an electric mixer helps tremendously. Even after so many years of baking, I only own a hand-held electric mixer, so never ever be discourage from baking and assume you need an expensive stand mixer to create marvelous and delicious baked goods. I always choose to line my cake pan. 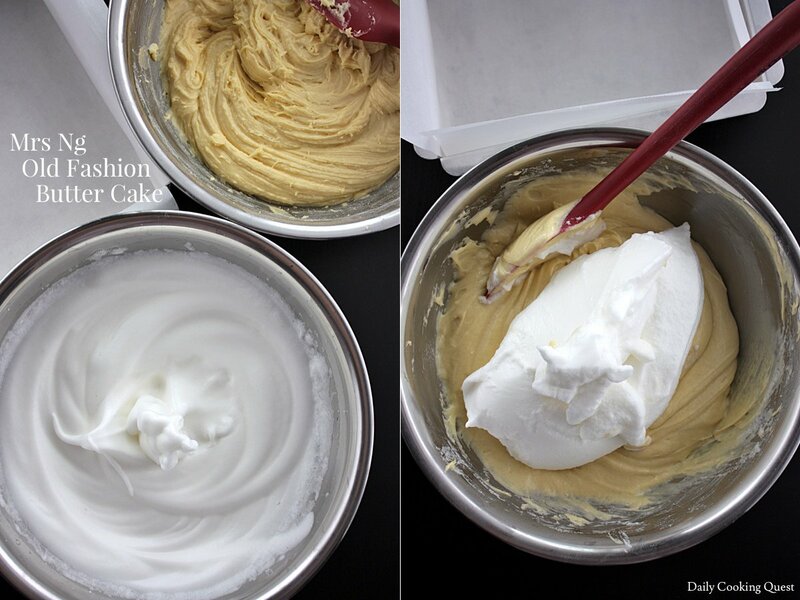 You don’t have to, but it does help tremendously when removing the cake from the pan. If lining the entire pan is too much of a trouble, I highly recommend lining just the base at the very least , and then grease the sides really well. The last thing any baker wants is to get a super pretty cake in the pan, and then the cake becomes not so pretty simply because it sticks to the pan! Preheat oven to 180 Celsius (350 Fahrenheit). Line an 8"x8" square cake pan with parchment paper and set aside. Whisk together all-purpose flour, baking powder, and salt. Set aside. In a large mixing bowl, beat butter and 150 gram sugar until pale and fluffy. Add vanilla extract and egg yolks, one at a time, and beat well with each addition. Next, alternatively add half of flour and half of milk, beat well with each addition, until all flour and milk is incorporated. In another large mixing bowl, whisk egg whites until foamy, then add 50 gram sugar in 3 batches. Continue whisking until stiff peak. 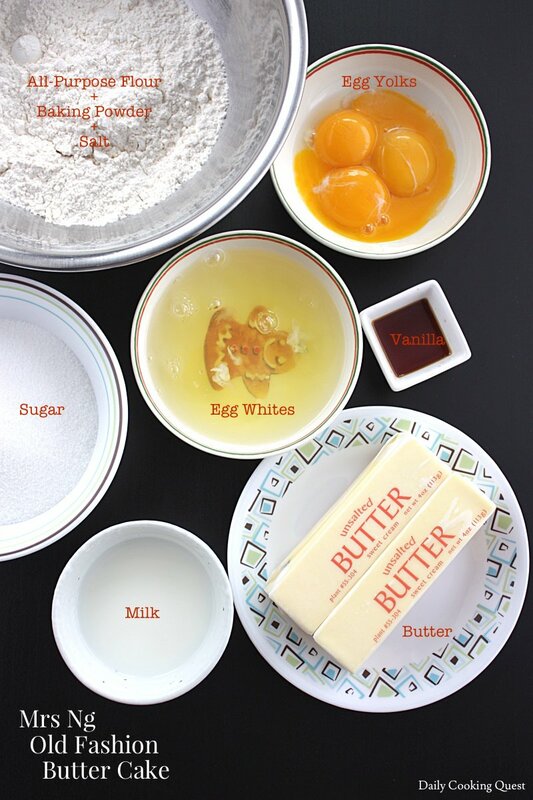 Fold the egg white into egg yolk batter in 3 batches with a spatula. Be extra gentle so you don't destroy all the air bubbles from the egg whites. 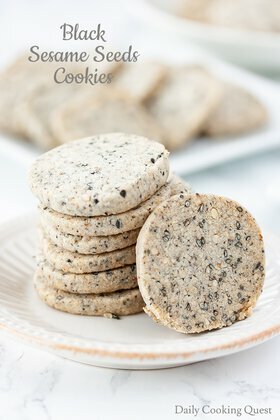 Pour the batter into prepared cake pan, and bake in preheated oven for 45 minutes, or until a cake tester comes out clean. Remove cake from oven and let it rest in the pan for 10 minutes, then gently remove the cake from pan (this is why a parchment paper helps immensely and ensuring the cake remains intact!) and let it cool completely on a wire rack. 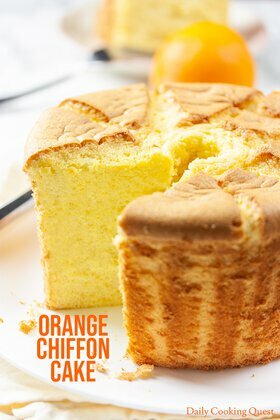 Once the cake cools to almost room temperature, cut into 16 serving slices. Hi Clarissa, if you want to double the recipe, you can either use two 8" square pans, or one 9"x13" rectangular pan. I have never tried doubling this particular cake, but when I do double other cakes, if the thickness of the cake is kept roughly the same (which is the case if you use two 8"x8" pans, or one 9"x13" pan), I start by keeping the same temperature and the same baking time. Then check from there. Most of the time, the total baking time will be the same! And only very very rarely I need to add more time, and even then, never more than 10 minutes from the original time for the single batch. 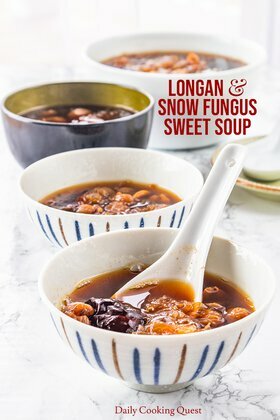 But....just a really quick disclaimer, I haven't tried with this particular recipe yet, I hope my previous experience is correct, but I cannot guarantee. Hi Priya, I use a normal oven without any fan, so I cannot say what temperature and for how long the cake needs to be bake in a fan assisted oven. I am sorry if I can't help. If other readers have experience baking this particular cake in a fan assisted oven, please share your experience.